It is Thanksgiving Weekend here in Canada. We celebrate our Thanksgiving every year on the second Monday in October. Moe and I thought this would be a good occasion to thank all of my friends and followers on Facebook and on my blog Thibeault's Table. So we thought what better way than to Give Away one of our Table Art Boards. The Holiday Season is fast approaching so we have chosen one of our larger "serving platter" style boards. Winner will be announced on Monday, October 18th. That is an unbelievably beautiful wooden board - like the heart and soul of a tree with character. I can imagine it set with a crusty multigrain loaf and a mix of aged cheddar and a homemade farmers cheese (I just took a cheesemaking class) with dried figs and other fruit. There is nothing like the aroma of fresh baked bread (or maybe your oatmeal scones with maple glaze!) to welcome friends and family. Thank you for your wonderful blog. Happy Thanksgiving! Hi Ann, I can't resist either :-) Happy Thanksgiving. Happy Thanksgiving to you and your family! Thanks for such a lovely giveaway. Happy Thanksgiving to you and your family and friends. I have admired your art for years. The wood and designs are amazing. Oh, what a beautiful board. One of my favorite ways to entertain is to fill up a bread board with breads, fruit, artisan meats and cheeses, and lovely condiments. Would look delicious on one of your boards. Thanks for the chance. Your boards are works of art! Each one has such character and beauty, and would be appreciated by anyone lucky enough to own one! Love your beautiful boards and food displays! Always look forward to them!! Happy Thanksgiving to you and yours! Happy Thanksgiving to you and your family. And to my cousins Sara and Hana celebrating their first Canadian Thanksgiving. Love your work. You make such beautiful things. Happy Thanksgiving! Thank you, Ann. This is quite generous. You boards are lovely. Many thanks. Happy Thanksgiving. So Have a great Thanksgiving. Hoping you had a Happy Thanksgiving! Lovely! 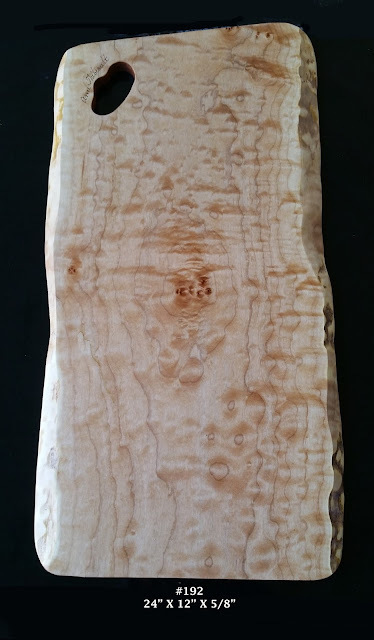 I have one of your quilted maple boards and just love it. Happy Thanksgiving. Thank you for giving us the opportunity to win this gorgeous board! I've long admired your boards and have enjoyed your blog. You've taken my bread baking to the next level. Cheers!